Here's our full guide to the best builds available for the Hammer in Monster Hunter World. There's no doubting the hammer as the hardest hitting weapon in all of Monster Hunter World, but it can be pretty tricky to master. In this Monster Hunter World hammer guide, we'll be walking you through everything you need to know to get started with the heavy weapon, including a few armor sets that you should be taking into battle with you. If you instead need anything else to do with Monster Hunter World, including how to capture any monster in the game with the Shock Trap and Tranq Bomb technique, as well as how to track down any monster in the game using the Scout Flies, head over to our Monster Hunter World guides walkthrough hub. The Hammer is one of the major damage weapons of MHW—it might not be incredibly quick, but it can nearly always stun a monster that you manage to hit in the head. 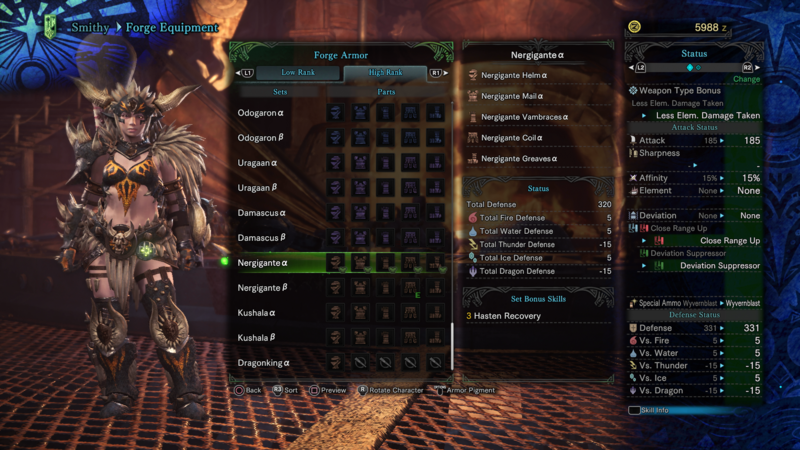 Your first choice of armor to go with the Hammer should be the Nergigante armor set, mainly because when put together it features the Attack Boost level 4 skill, which increases both your attack and your Affinity. The Nergigante Hunger skill will let you increase health while attacking, meaning you can continue to lay into monsters, and the Stamina Surge skill boosts your stamina recovery speed by 30%, so you can keep on attacking and dodging with little pause. 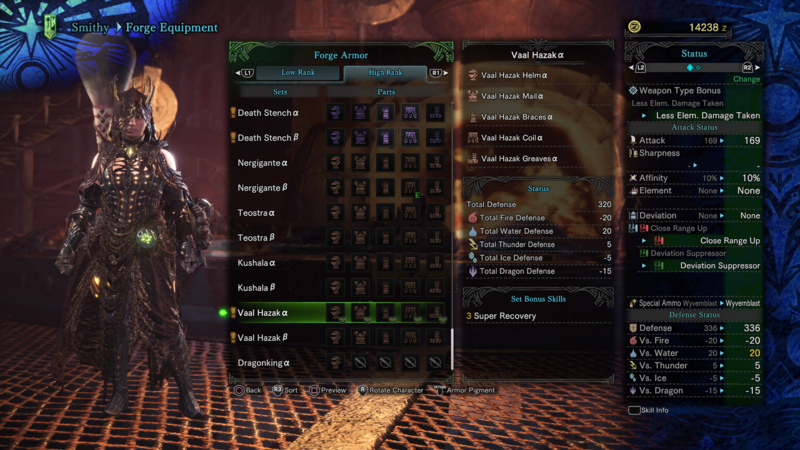 The Vaal Hazak armor set is also a viable choice to pair up with the Hammer, as it has the nice Peak Performance ability, which grants you a hefty +20 attack when your health of full. The Vaal Hazak Vitality skill lets you health recover all the way back up to full on its own, and the Recovery Speed ability triples the rate at which you heal naturally, meaning as long as you can hold off from being attacked for a few seconds, you’ll nearly always have that Peak Performance skill active. 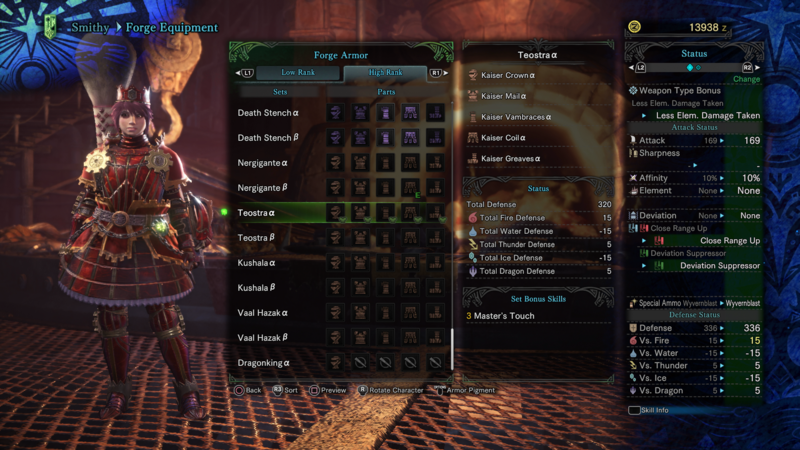 The Teostra armor set can also work well alongside the Hammer, mainly because it has the Weakness Exploit skill which increases damage to the monster’s weak points by 50%. The Teostra armor set also prevents your weapon from losing sharpness during critical hits, and also gives you a nice defense bonus of +15, giving you much needed protection while you’re up close against a monster. As for the Charms that you should take with you when using the Hammer, the Challenger Charm 1 is a good option, since it can boost you attack power and Affinity when a monster becomes enraged. The Unscathed Charm 1 is also a solid choice, since it has the same Peak Performance ability that the Vaal Hazak armor set has, which only increases when the two are equipped in conjunction. Now that we’re all done our guide on the best build for the Hammer in MHW, continue ahead to our complete weapons guide, or our guide on the best armor in the game. Why Super Smash Bros. Pros are Saying Joker Could be a Top Tier Fighter The new fighter in Super Smash Bros. Ultimate could be a top-tier contender. The Best Version of Every Final Fantasy Game Some Final Fantasy games have remakes of their remakes. What's the definitive version of each single-player mainline installment? Let us help you. The Top 25 RPGs of All Time #1: Chrono Trigger Chrono Trigger's sublime soundtrack arguably tells its classic story more effectively than its character dialogue.